Thinking about buying granite countertops? Here’s what you ought to know beforehand. Granite countertops claim the top spot in popularity for kitchen remodeling and renovation projects. They are known for their beauty and durability. Still, there are a few other aspects of granite ownership that you should know before making your purchase. Find the option that will work best not only for the design of your kitchen, but also for the design of your lifestyle. Many people see the smooth, flat surface of granite countertops and forget to think about seams. Unlike concrete or cement, granite is not poured to fit a particular mold, and indeed does need to be cut into the perfect shape. This means that, while the fabricator will do their due diligence to make your countertop look as seamless as possible, you should have a conversation about the possibility and visibility of any seams. 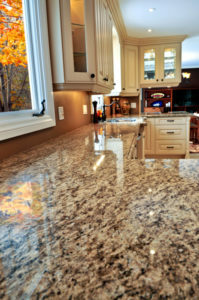 The professionals will take all the necessary measurements before cutting your granite and use techniques to ensure that if any seams are present, they are unobtrusive. Don’t use or think of your granite countertops as an all-purpose workbench. Although granite is incredibly durable and able to withstand high heat and most of your knife cuts, doesn’t mean that you should put it to the test. Cutting directly onto granite will dull your knives, and extremely high heats will affect your countertop’s finish, or even lead to cracks. As previously mentioned, granite is one of the most durable countertop options on the market, but it is a natural stone, and not indestructible. It is still susceptible to cracking, chipping, and even breaks under extreme circumstances. Be careful not to use harsh tools on your surface and keep up with regular maintenance. Speaking of maintenance, your granite should be sealed, polished, and cleaned to protect it from scuffs, spills, chips, and other possible damage. You can find the appropriate cleaning products to keep your granite looking like new for years to come at your local hardware store. This entry was posted on Friday, January 26th, 2018 at 11:45 am. Both comments and pings are currently closed.